The Coalition for Civil Society Freedom invites all to attend a public meeting on Thursday, 11 October from 2pm – 5pm at Woodquay Venue, Dublin. The purpose of this meeting is to raise issues and inspire discussion relating to the methods currently available to people in Ireland when it comes to engaging with the political system. Representatives from the EU Fundamental Rights Agency (EU FRA) and Civicus (the World Alliance for Citizen Participation) will speak from 2pm until 3pm and the public meeting will follow. Your vote shouldn’t be the only way that you can engage with the political system. If you’re concerned about an issue, you should be able to start a voluntary or not-for-profit group. Your group should also be able to fundraise and engage in advocacy, ie speak to your local TD, start an awareness campaign, or organise a protest. In short, you should be able to make your voice heard. However, in Ireland right now, if your organisation engages in both fundraising and advocacy you risk falling foul of the Electoral Act and the body which oversees its enforcement – the Standards in Public Offices Commission (SIPOC).Your organisation may be forced to close down, and you yourself could be threatened with legal action. That’s why the Coalition for Civil Society Freedom is campaigning for reform of the Electoral Act. We’re campaigning to keep #thePeoplesVoice in power. Join us from 2pm to discuss what FRA described in January as “a blanket ban on foreign funding” in Ireland. Afterwards we will host a discussion on real-life stories of the impact the Electoral Act is having on community and voluntary organisations. We will encourage people to share their stories. We’ve already seen Education Equality have to dissolve and transfer to a limited company which can’t accept donations of over €100. Amnesty have had to battle SIPOC in court, and risked losing credibility with the public, over legitimate international funding for a human rights campaign. Organisations have been threatened with legal action and some have had to close down altogether. Both Amnesty and Education Equality will speak at the public meeting. We hope you can join us for this event. On 11th September 2018, ICCL was honoured to welcome the Scottish Government’s Minister for Older People and Equalities, Christina McKelvie, to our offices. ICCL team with Minister McKelvie. 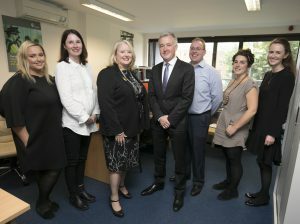 The Minister was in Ireland to meet with Irish Government and human rights bodies and organisations to discuss cooperation and areas of common interest between Ireland and Scotland in relation to equality and human rights. During her visit she met with Minister of State David Stanton TD, the Irish Human Rights and Equality Commission and with ICCL. The visit was organised by the Scottish Government’s innovation and Investment Hub in Ireland. The issues which we discussed with the Minister included current issues relating to women’s equality, structures and policies for promoting human rights,Traveller rights and the human rights impact of Brexit. 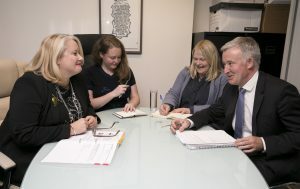 The Minister shared information about a number of innovative measures being taken by the Scottish Government to integrate human rights and equality provisions in all aspects of Government policy, budgeting and planning. ICCL believes that there is great potential for Ireland and Scotland to learn from each other in these areas and we look forward to future cooperation with colleagues in Scotland on issues of human rights and equality post-Brexit. 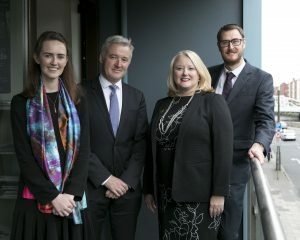 L-R Dr Maeve O’Rourke, Liam Herrick, Minister McKelvie and Sandy McPhee, representative of the Scottish government in Ireland. The Irish Council for Civil Liberties (ICCL) today expressed its disappointment over the European Court of Human Rights’ decision not to revise its conclusions in the 1978 case of Ireland v United Kingdom regarding the ‘deep interrogation’ techniques practiced by the RUC in Northern Ireland in 1971 and 1972. The Irish Government had applied to the European Court for a revision of its 1978 finding that five techniques perpetrated against 14 men for a week – wall-standing, hooding, exposure to constant noise, sleep deprivation, and deprivation of food and drink – amounted to ‘inhuman and degrading’ treatment, rather than ‘torture’. The Irish Government argued that, had the Court been aware in 1978 of information now available in public archives (due to the 30-year rule), it would have concluded that the five techniques together constituted torture. The Irish Government pointed to records which demonstrate that, contrary to the assertions of the medical expert chosen by the UK Government at the time of the original hearing, the same medical expert knew that the health effects of the interrogation techniques could be long-lasting and severe. The Irish Government also pointed to a raft of internal UK Government documents which demonstrate that the interrogation techniques were authorised at Ministerial level, that a political decision was taken that there should be no investigations with a view to prosecuting perpetrators, and that there was a concerted effort at an official level to prevent the European Court (and the complainants) from accessing information about the techniques and how they were authorised.